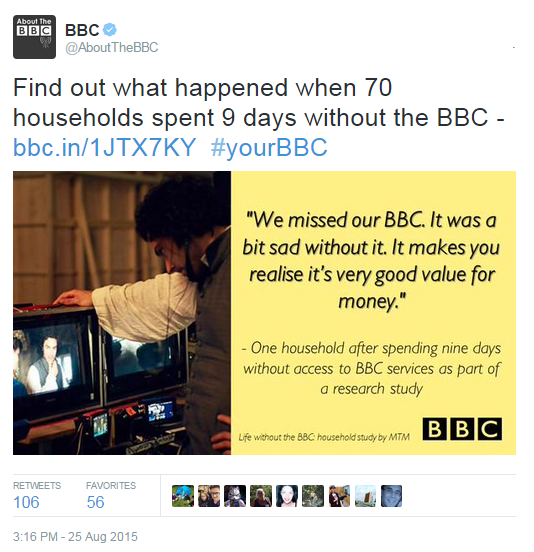 It was difficult to miss the BBC’s latest charter review PR efforts on social media on August 25th. Unfortunately, despite the claims in those Tweets, the link provided does not lead to the ‘full study’ but to a press release put out by the BBC which was also amplified in the Radio Times and through video. However, it later emerges that over 31% of those who took part in the exercise (and no information is provided regarding how they were identified or recruited) were not among “the minority who say the licence fee is too high” at all. “Thirty-three out of the 48 households who originally said they would prefer to not pay at all and not receive the BBC, or who wanted to pay a lower licence fee, changed their minds and said they were now willing to pay the full licence fee for the BBC. No graphics were promoted on BBC Twitter accounts quoting the 15 households who did not change their minds and the BBC’s press release reveals nothing about the household who originally supported the licence fee and apparently had a change of heart. In 2013/14 there were 25,419,296 licences in force in the UK and trends would suggest that the number would have risen since then. If, as the BBC claims, 70% of households are content with the current arrangement, that places well over seven million households in the category termed “the minority who say the licence fee is too high”. The sample size of this BBC commissioned study is obviously therefore far too small to provide results with any statistical relevance. It is once again unlikely that the people who paid for this study will be able to find out how much it cost. But if the BBC is keen to persuade its funding public that they are getting value for money, then surely a very basic step would be to avoid wasting resources on ‘studies’ which fail to meet the minimum standards of statistical credibility. Long-time BBC Watch readers will be familiar with the phrase “for the purposes of journalism, art or literature”. It is the clause cited by the BBC to justify its refusal to release the Balen Report and it was used when a member of the public submitted a Freedom of Information Act request concerning the number of complaints made to the BBC. The upcoming once-in-a-decade BBC charter review would suggest that the timing of the appearance of this advert is not coincidental. In fact, readers may recall that back in 2013, the Telegraph reported that the BBC’s Director General raised the possibility of using funds provided by the obligatory licence fee to persuade the public to carry on paying it. “The BBC must “get aggressive” about selling its virtues to the nation, director-general Lord Hall has argued, as he disclosed the corporation will be using its own airwaves to convince viewers it is good value. Lord Hall has said the BBC must be “less British” about telling the public the £145.50 licence fee is worth paying, as he insisted it is “quite wrong” to accuse the corporation of dominating the media. Apparently though the BBC – which purports “to operate as transparently as possible” – does not believe that the people who funded this advert are entitled to know how much it (or the rest of the corporation’s considerable efforts relating to charter renewal) cost. Towards the end of last week several UK media outlets reported on remarks made by John Whittingdale MP concerning the future of the compulsory licence fee. Whittingdale added: “In the long term it is unsustainable. When I say unsustainable in the long term, I’m talking about over 20, 50 years … I don’t like the idea of a licence fee, I would prefer to link it perhaps to some other tax, and I think decriminalisation is almost certain to happen. So where did the new head of the BBC Trust get that idea? The Telegraph may have provided some insight into that question in its report on the topic. 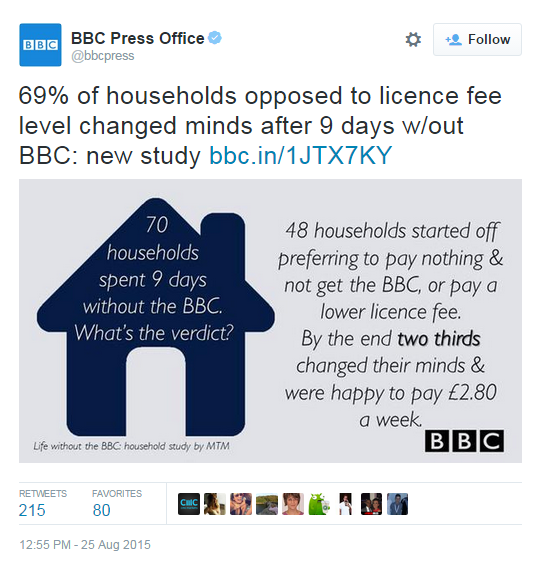 Can we presume that the apparently problematic BBC-commissioned research showing ‘overwhelming’ public support for the licence fee which is now being used to promote the case for the continuation of the compulsory licence fee was funded by none other than the people who are obliged to pay the licence fee? 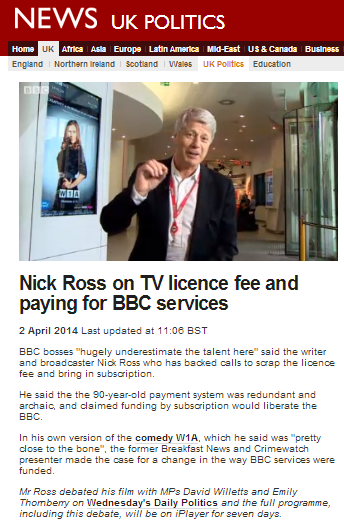 Credit where credit is due: on April 2nd the BBC finally came up with an alternative view on the subject of the licence fee. BBC presenter Jo Coburn challenged Ross’s claims. She said: “The BBC is convinced it would lose money on the evidence and the polls they have done, people would not pay if they were not forced to”. But Ross, best known for presenting the BBC’s Crimewatch programme, maintains that there is a bias in favour of the licence fee from within the BBC. “The people commissioning this research will cling to the licence fee. They are cherry-picking evidence which sustains their own view,” he said. “I understand where they are coming from. They are frightened and timid and they do not want the BBC to be challenged. Readers in the UK can view that programme for a limited period of time on BBC iPlayer here. 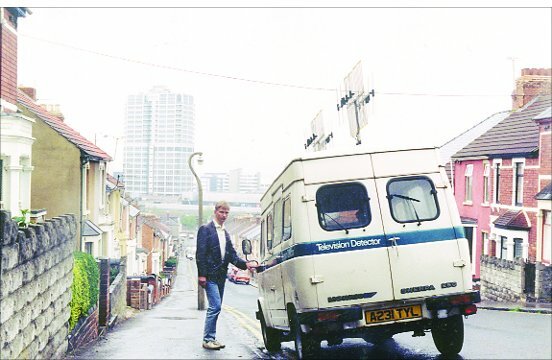 Nick Ross also made a short film on the subject which was posted on the BBC News website and can be seen here. March 31st saw the appearance of a rather thinly-veiled ‘you’ve never had it so good’ article on the subject of the licence fee on the ‘Entertainment & Arts’ page of the BBC News website. 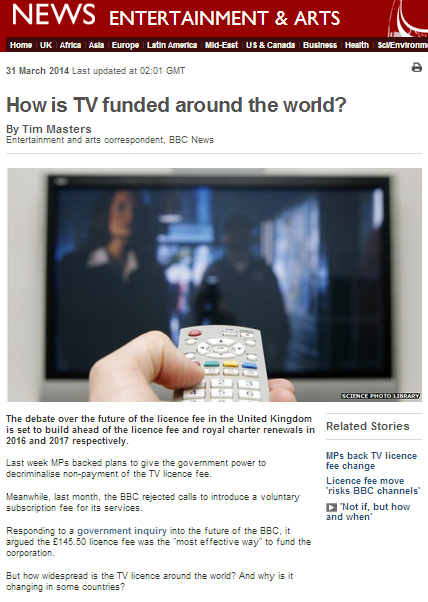 Written by BBC News’ entertainment and arts correspondent Tim Masters and titled “How is TV funded around the world?“, the article actually failed to answer that question with regard to countries which do not employ some version of the TV licence fee or a tax for the same purpose, but did go into detail regarding mostly European states which do. Readers were not informed how television is funded in countries which have abolished the licence fee such as Australia, Belgium, Cyprus, Holland or New Zealand or in countries (with one exception) which never had such a system such as Spain, Luxembourg, Canada or the United States. The article opened with a presentation of the BBC’s own stance on the licence fee but no alternative viewpoint was provided. “The debate over the future of the licence fee in the United Kingdom is set to build ahead of the licence fee and royal charter renewals in 2016 and 2017 respectively. Last week MPs backed plans to give the government power to decriminalise non-payment of the TV licence fee. Meanwhile, last month, the BBC rejected calls to introduce a voluntary subscription fee for its services. Once again this article raises issues relating to the use of publicly-funded BBC resources to promote the corporation’s own campaign to keep – or even extend – the licence fee. It also again prompts the question of whether BBC editorial guidelines on impartiality will at some point result in its funding public hearing or reading any alternative views to those on the topic which are currently being vigorously promoted by the BBC itself. Change and reform at the BBC has been the theme of quite a few recent media reports – including some coming from the BBC itself. Although it has yet to be approved by the BBC Trust, a proposal has been put forward to close down BBC Three television in the autumn of 2015 and to move its content online. The future of BBC Four is apparently also up for discussion. “BBC Four could be the next television channel to be scrapped, after the corporation confirmed that BBC Three was to become available on the internet only. Danny Cohen, the director of television, said that he was unable to guarantee the future of BBC Four, the highbrow art and culture channel, as the organisation sought cut costs. He warned that if the next license fee settlement was not sufficiently generous, the channel could be next in the firing line. He was speaking after the BBC unveiled plans for the youth channel, BBC Three, to be moved online, to save £50 million a year. “The comments will be seen in the context of the charter renewal and license negotiations with ministers, due to be completed by the end of 2016. Concurrently, some MPs are proposing to decriminalise non-payment of the BBC licence fee whilst the BBC’s director general recently promoted the idea of extending it to cover BBC iPlayer. “Hall used a speech at the Oxford Media Convention on Wednesday to mount a robust defence of the BBC and the licence fee, saying it was “one of the finest broadcasting organisations in the world” and “great value for money” reaching 96% of the population ever [sic] week. 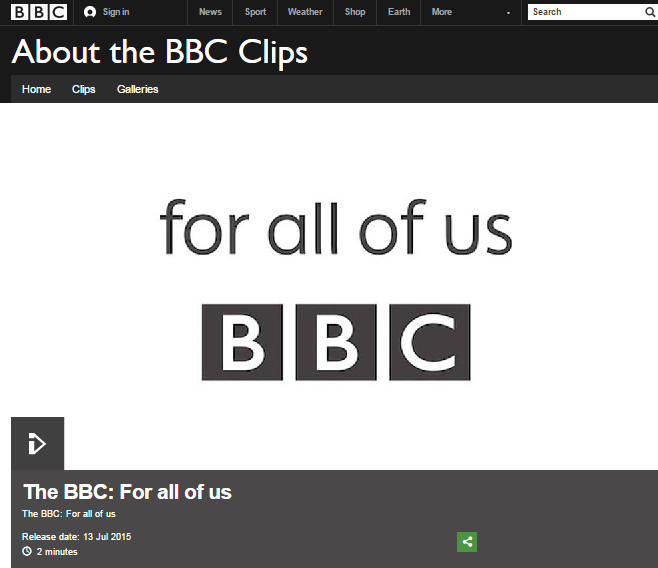 Seeing as the licence fee is currently obligatory payment for anyone watching television in the UK even if they do not actually view BBC-produced content, Tony Hall’s comments obviously raise the interesting question of whether the same principle would, under his proposal, be applied to owners of computers, tablets or smartphones regardless of whether they in fact access BBC iPlayer or not. In its own report on Tony Hall’s proposal to extend the licence fee to BBC iPlayer, the BBC devoted considerable column space to the amplification of a recent report produced by the Reuters Institute for the Study of Journalism. “Speaking at the Oxford Media Convention on Wednesday, however, Lord Hall said the “flexible” nature of the licence fee allowed it to adapt over the years to encompass changing patterns of viewers’ behaviour. His comments come amid renewed calls for the licence fee to be shared with other broadcasters and for it to be cut in response to the BBC’s alleged mismanagement of its financial affairs. They also coincided with the publication of a new study that claims cutting the BBC licence fee will limit consumer choice and value for money. The report suggests the BBC would be “reduced to a minor sideshow” if so-called “salami-slicing” continues. Without BBC television, it claims, most viewers would “have a greatly reduced choice of programmes they wanted to watch”. The report, by Oxford’s Reuters Institute for the Study of Journalism, is entitled What If There Were No BBC Television? : The Net Impact on UK Viewers. Its authors, the academics Patrick Barwise and Robert G Picard, say that without BBC TV there would be less revenue in the TV industry and as much as 25% less investment in content. The latter, they write, would be “a severe blow to British production companies” of the kind that generate “first-run UK content”. The report assumes that commercial broadcasters would increase their investment in content if they were no longer “crowded out” by the BBC. Despite this, it insists there will be less overall investment – and that most UK households would “suffer detriment”. It says they would either be “paying slightly more for slightly less choice” than they currently do with the licence fee, or “paying slightly less for much less choice”. 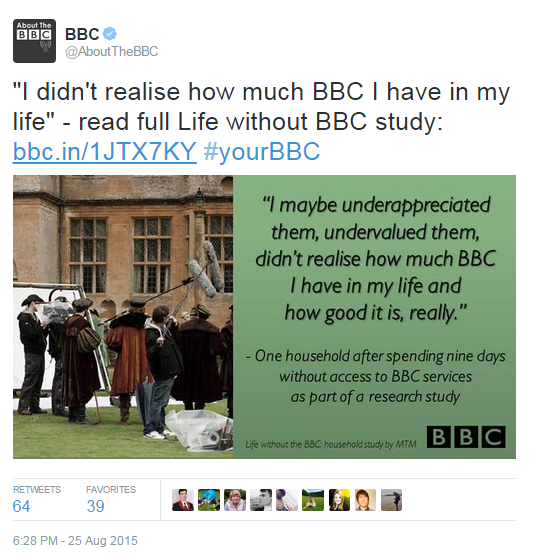 However, this BBC article neglected to inform readers that the organisation which produced the seemingly objective, academic report on “the net impact” of potential changes to the BBC – the Oxford University-based ‘Reuters Institute for the Study of Journalism’ – was, according to its 2012/13 report (see page 51), a recipient of funding from the BBC College of Journalism, BBC Global News, BBC Media Action and the BBC Trust and that its advisory board (which, inter alia, gives “advice and guidance on general research directions”) is chaired by Chris Patten, who is also of course the Chancellor of Oxford University and chairman of the BBC Trust. Clearly the gloves are off in the BBC’s battle to keep – and even extend – the licence fee, but it will be interesting to see whether the funds provided by BBC licence fee payers will also be used to enable them to read, watch or hear alternative views on the subject and how the BBC will handle the rather glaring conflict of interests when it comes to reporting the debate surrounding its own funding. The run up to the next review of the BBC’s Royal Charter in 2016 is already showing signs of being dominated by public debate on the subject of the obligatory licence fee. The BBC itself is of course keen to perpetuate that guaranteed source of income and, according to a recent report in the Daily Telegraph, may even begin to use those funds to produce advertising to persuade the British public why it should continue to provide them. The opposing case for the abolition of the licence fee and its replacement with voluntary subscription was recently made in an interesting article in The Commentator by Tim Congdon. “Time and technology wait for no organisation, no matter how revered. The next two years will see a lively debate over the future of the British Broadcasting Corporation, with the current Royal Charter due to run out at the end of 2016. The early talk is of an extension of the licence fee for a further decade to 2026, but of possible reductions in its value and certainly of freezing it in real terms. What do BBC Watch readers think? 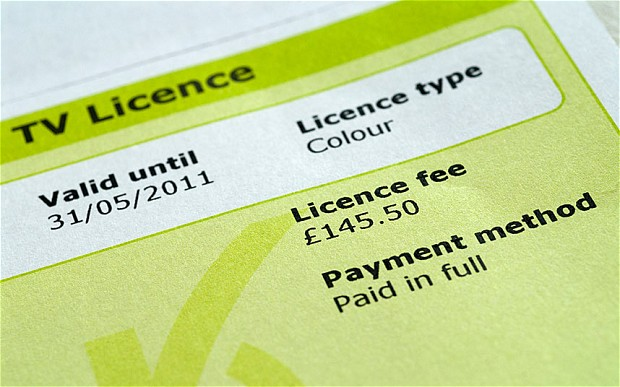 Can the case for payment enforced by law still be made in the digital age and how would you feel about your licence fee being used to create adverts to persuade you to continue paying it? Tell us in the comments below.